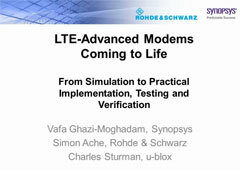 When it comes to LTE/LTE-A modem development, achieving standard compliance is a key requirement. Planning for an integrated verification and testing flow from concept to implementation is mandatory to avoid late-minute surprises. This webinar will explain the steps that need to be taken at the different stages of the design process, and how these steps can be integrated into a complete design and verification flow.